Lipton was not showing much remorse partying after being involved in an alcohol related accident. While the woman Lipton hit was recovering in the hospital, Lipton was out partying and one of his friends posted pictures from the party that included Lipton on Facebook. I recently blogged about being aware of the digital footprints we leave on the internet citing a USTA professor as an example. His explicit emails with references to his students were made public and printed in the newspaper with this incident making front page news. According to the article at CNN.com, discussion of how law officials use the pictures of social networks to portray the nature of one’s character is becoming commonplace. The pictures, when shown at sentencing, not only embarrass defendants but can make it harder for them to convince a judge that they’re remorseful or that their drunken behavior was an aberration. (Of course, the sites are also valuable for defense lawyers looking to dig up dirt to undercut the credibility of a star prosecution witness. Prosecutors do not appear to be scouring networking sites while preparing for every sentencing, even though telling photos of criminal defendants are sometimes available in plain sight and accessible under a person’s real name. But in cases where they’ve had reason to suspect incriminating pictures online, or have been tipped off to a particular person’s MySpace or Facebook page, the sites have yielded critical character evidence. While teaching students how to perform boolean searches on the internet or cite sources, it is just as important to stress the awareness of the digital footprints each of us leaves behind. Hopefully the students will not have their digital footprints used as evidence against them in a criminal matter as the teens did in the article but examples such as these show the importance of being cognizant of one’s presence on the internet. Colleges and employers often do searches on the social networks and make decisions based on their findings. I believe emphasizing the concept of digital footprints is as important in preparing students for the 21st century as is internet safety to avoid predators, using technology tools and social networks. For some students, their digital footprint could make the difference between a sentence of life or death. My Twitter Followers are Gone? As I was ‘plurking‘ this afternoon, I soon discovered that several people were missing many of their Twitter followers. For many of us, tweeting and plurking is serious business and crucial to professional development. Through the tweets and plurks, I learn a great deal about new technology tools, if someone is streaming a workshop or session live, advice on tech strategies and tools, as well as where and what people are eating for dinner. Granted, the posts about eating dinner or going to bed are not posts that help me grow professionally but the two micro blog tools are my lifeline to what is currently happening in the ed tech world. It is live, up close, and personal with notices of all kinds of learning opportunities available for free presented from all parts of the world. This evening I noticed on my Twitter profile page that the problem of followers ‘disappearing’ from our lists was ‘almost finished’. I took a screenshot as I found the notice interesting but I don’t have complete confidence in the efficiency of restoring the missing followers. I haven’t found an application that has the same features of Skitch where you can highlight and draw on screenshots so I only have a plain screenshot here with a poorly handdrawn circle around the statement of ‘almost all’. The statement doesn’t cause me to have much confidence in the restoration process. Update: This has been fixed but the actual numbers and profile pictures might not look right until tomorrow afternoon due to caching. Recently, some people began noticing a decline in their following and follower numbers. We investigated and determined this was caused by an error during a database upgrade. We’ll be restoring followers throughout the day to those who were affected and keeping the status blog and Get Satisfaction forum updated with specifics. So by tomorrow afternoon Twitter profiles ‘might‘ not look right due to a caching difficulty. Okay, but will all of my followers and their tweets show up en masse? I don’t think anyone really knows. 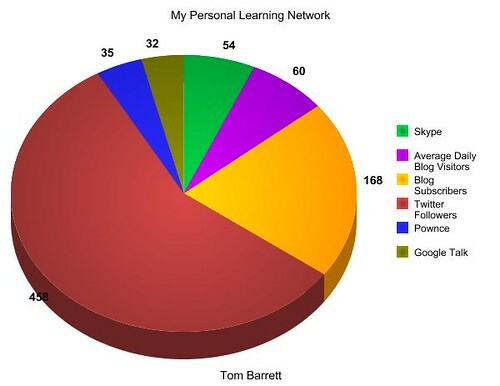 To show how important tweets are to us, a fellow edublogger Tom Barrett posted a picture to his Flickr account showing the breakdown of his Professional Learning Network (PLN). The picture was included in his post about missing his Twitter Connections and posted to Flickr. I found it extremely interesting as if I were graph my connections to learning from other ed tech colleagues the dispersion of resources would be very similar. Notice the amount of the graph attributed to Twitter. I definitely concur that Twitter is a crucial piece of learning in my PLN. If you graphed your PLN resources how much would be allocated for learning from Twitter or Plurk? Stop and think about it – it just may surprise you the depth and volume of learning that occurs from micro blogging. So please continue to Tweet and Plurk and continue to make those networking connections. As I was reading the Twitter posts from people I follow, Justin Reeve, author of the “Insights into Educational Technology” blog, submitted a post about Dabbleboard. I decided to check it out and was so glad that I did! Often times I had said to myself that I wish there was a way to show someone on the internet how to do some type of process, demonstration, diagram or facilitate an activity on a virtual whiteboard. Dabbleboard is one such tool. When drawing a diagram using Dabbleboard, you can use the mouse to draw a circle or rectangle and Dabbleboard automatically converts the object to a typical diagram object. Use can also use the freehand tools to draw objects as well. You can resize and move objects as well as add text anywhere in the diagram by clicking in the whitespace and typing. I created a very basic diagram to demo some of the features of Dabbleboard below. Make sure you click on the diagram image. It will take you to the public link (hopefully since the link was associated with my email). While there, manipulate a few of the objects and try some of the the tools. I tried several images of the screenshot but haven’t been able to find one that doesn’t look blurry to me. Anway, the resolution of the actual Dabbleboard diagram is much better. The main feature that I liked is the ability to share the diagram created. I haven’t played with the feature yet but from the video tour it appears that several people can collaborate, edit and view the same diagram. You can import objects into the workspace for additional collaboration. One think I had to remember was to click on the object to activate the selection handles to move or resize. Overall, this is a great free tool that I will definitely use with students and when collaborating with colleagues. I see endless opportunities to use this tool. Thanks Justin for sharing! I just finished reading an astonishing blog post commenting on school districts that are resorting to shortened teacher prep programs, if you can call it that, to ease teacher shortages. Recently I was surprised to hear two different school districts in major cities advertising for “anyone with a bachelor’s degree” to apply to teach. The advertisements stated that the districts were desperate for teachers and could certify anyone with a bachelor’s degree. One district even said certification could be accomplished in only two Saturdays of preparation. In Texas, a candidate with a bachelor’s degree can participate in an alternative certification program. After teaching for one school year and attending classes on evenings and weekends during that year, provided he/she passes the state certification exam, a candidate can become a certified teacher. In my city with many school districts, primarily only the smaller school districts hire candidates in alternative certification programs. In my experience, those districts are have a difficult time attracting highly qualified teachers due to poor working conditions or low performing campuses. Although that isn’t always the case, it happens more often than not. After having been asked to step in and ‘assist’ teachers in these alternative certification programs, my experience has found the caliber of teachers generated by these programs to be of a lesser quality. Especially those that retired from a military career. Teaching is on the opposite spectrum of careers and the candidates I taught with had a hard time dealing with disrespect from students, managing a classroom and being flexible with schedule changes. If I were a parent I would not have wanted my child to be a student in their classrooms as their students definitely suffered academically. One year is not enough for some of these candidates for preparation much less ‘two Saturdays’. For some, no time period will assist them in becoming a highly qualified teacher according to NCLB standards. Not all teachers that go through alternative certification programs are indequate or ill equipped. I taught with a two teachers in particular that were so successful I had no idea they were a product of alternative certification programs until we had a conversation one day during a grade level planning session. They are natural teachers with great classroom management and those two traits cannot be ‘taught’ in any educator prep program. Either you are cut out to be a quality teacher or not and generally the skills that makes awesome teachers awesome cannot be taught or even defined. Great teachers have ‘it’. Students, parents and colleagues know if a teacher has the ‘it’ factor and everyone knows if a doesn’t doesn’t have ‘it’. Ever read about or seen the movie, “The Ron Clark Story“? He took over a deplorably behaved class and transformed their achievement, behavior and attitudes. He definitely had ‘it’. Without being overly confident I know have ‘it’. Do you? Digital Footprints are traces left by someone’s activity in a digital environment. There are two main classifications for digital footprints, passive and active. A passive digital footprint is created when data is collected about an action without any client activation, whereas active digital footprints are created when personal data is released deliberately by a user for the purpose of sharing information about oneself. I was reminded of this concept as I was reading the local newspaper online and came across this article entitled, “E-mails detail UTSA professor’s fantasies“. Through the open records act, all of the professor’s emails were obtained and are posted online depicting his fantasies involving the students in his classes. Although this isn’t an example I would share with others, the article clearly demonstrates the importance of being aware of the nature of the digital footprints that one leaves on the internet. How unfortunate to learn this lesson firsthand in the public eye. "Teachers are Missing the Mark in Math"
I came across this article last week entitled, “Teachers are Missing the Mark in Math“. The article reviewed a national study about the capability of teachers to teach mathematics, primarily at the elementary grades. The study recommends that colleges and universities develop more difficult tests to certify teachers upon graduation of teacher prep programs. The study attributes the poor preparation as the reason that US students perform much lower on standardized mathematics tests. Because teachers are not prepared to teach elementary students math, Walsh said American elementary school students continue to lag internationally in math and science rankings. After teaching elementary and middle mathematics, I concur with the findings that many elementary teachers struggle teaching math at a level that helps students develop a solid foundation of mathematics concepts, algorithms, properties, etc. As a result, students progress to the next grade level ill prepared. Today, as I am sure you are aware or you wouldn’t be reading this post, there are tons resources available to assist teachers in designing effective math lessons. I find it very interesting a comment made by Scherry Johnson who is the UT-Dallas Teacher Development Center Director. She oversees the teacher prep program at UT-Dallas.
. . . nobody at UT-Dallas knew that the National Council on Teacher Quality was evaluating the school, and suspects the study is full of mistakes because it looked only at syllabi and a textbook. Unfortunately, many college professors have not taught elementary grade levels and have only experienced the result of poor mathematics at the elementary levels when the students reach them in secondary grade levels. In my opinion, elementary teachers carry the burden of providing students a foundation in all content areas without being able to focus solely on mathematics as in secondary grade levels. When I taught middle school math, the level of instruction I delivered was much higher than when I taught elementary grade levels as I only had to focus on my math preps. I hate to admit it but my students didn’t receive quality instruction in content areas that were not tested with a standardized test. Although I was responsible for teaching social studies, social studies lessons and activities took a backseat to language arts and mathematics. Over time, I became skilled at integrating content areas into the areas of instruction that were assessed by standardized tests exposing my students to effective lessons in all content areas. It was difficult and time consuming but I felt my students were well rounded as a result. Integrating technology components definitely upped the efficacy of activities, lessons and units that I designed. “Blown away” by using manipulatives? Surprised by the instructional strategies the professors employed in the teacher tech program which she oversees? Teachers in the elementary prep program only have to take one class on teaching mathematics and Johnson was commenting on “…that methods class…“. No wonder teachers are ill prepared when supervising advisors and professors have not kept up with trends, instructional strategies and technology tools to enrich instruction. Teacher prep programs are only as good as the professors. If the professors, or faculty members are experienced with many years in education but have not kept up to date on the latest educational trends and strategies to improve instruction teachers just entering the profession will struggle and quickly become frustrated and leave the profession. Statistics show the turnover for teachers in the first five years is very high and I am sure the number is growing each year. I am not a professor and don’t proclaim to know all there is to being an effective teacher but I definitely make an effort to reflect, grow and learn to employ strategies that are research based to improve instruction. Incorporating technology components is a big focus in my lessons and activities although I have worked with ‘dinosaurs’ that believe in paper/pencil instruction and working out of the textbook with out supplementing with quality, motivating activies. It is a vicious cycle of generating ill equipped teachers producing ill equipped students who become ill equipped teachers over and over. The question now is how do we stop this cycle and generate effective teachers producing students who received quality instruction at each grade level? What are your thoughts?